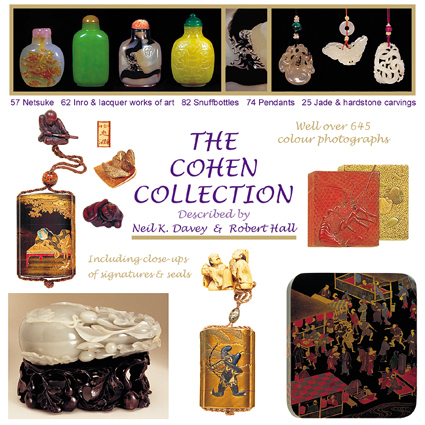 A reference catalogue of 'The Cohen Collection' of fine antique netsuke, inro, snuff bottles, pendants and jade carvings. An interactive reference catalogue of many fine 18th century Asian antiques, 645 colour photographs (with close ups of all signatures and seals) fully described by either Neil K. Davey, or Robert Hall. A valuable and beautiful reference work for those interested in collecting, designed for the connoisseur's library! This is an easy to use website that has many advantages, that are impossible in a book and it really is a beautiful reference work for the serious collector and expert. 57 Netsukes, 62 Inro and lacquer works of art, 3 Ivory carvings. "There are fine examples from Kyoto, Osaka, Edo, Nagoya, Gifu and Hakata, as well as unsigned and unattributable pieces from the early 18th to the late 19th century. . . . By some standards the collection is not large. However, it does not need to be, there is much to be said for quality, rather than quantity and the present collection has the former in abundance." 82 Snuff bottles, 74 Pendants, 25 Jade & hardstone carvings. "It is a tribute to the Cohen's artistic awareness that they have been able to assemble so many works of art in these two areas, while maintaining the common bonds of excellent workmanship, charming subject matter and, above all, that elusive bit of 'magic' (for want of a better word) that turns an inanimate object into something special and important." Also with contributions by Richard Marchant, Clare Lawrence (Clare Chu) and Roger Kerverne. Includes Silhouette Picture Snuff Bottles, Cameo Carved, Inside Painted, Imperial Yellow, Overlay Glass and Well Hollowed. Jade Mutton Fat, Celadon, Russet Skin, Imperial and Suzhou. The original CD-ROM will no longer work with the latest editions of Windows, also 'In Search of Netsuke & Inro' has been out of print for many years, so now both are available, for everyone to enjoy, on the Internet. To John Neville Cohen's dedicated site for Painting with Light Limited Edition (only 8 of each picture), fine art prints for sale.